Art during the Middle Ages was different based on the location in Europe as well as the period of time. However, in general, Middle Age art can be divided up into three main periods and styles: Byzantine Art, Romanesque Art, and Gothic Art. Much of the art in Europe during the Middle Ages was religious art with Catholic subjects and themes. The different types of art included painting, sculpture, metal work, engraving, stained glass windows, and manuscripts. The end of the Middle Ages is often signaled by a great change in art with the start of the Renaissance Period. The start of the Middle Ages is often called the Dark Ages. This is the period of time from 500 to 1000 AD. The main form of art during that time was Byzantine art produced by artists from the Eastern Roman Empire, also called Byzantium. Byzantine art was characterized by its lack of realism. The artists did not try to make their paintings realistic, but focused on the symbolism of their art. Paintings were flat with no shadows and the subjects were generally very serious and somber. The subjects of the paintings were almost entirely religious with many paintings being of Christ and the Virgin Mary. The period of Romanesque Art started around 1000 AD and lasted to around 1300 with the beginning of the Gothic Art period. Art prior to that is called pre-Romanesque. Romanesque art was influenced by both the Romans and Byzantine Art. Its focus was on religion and Christianity. It included architectural details like stained glass art, large murals on walls and domed ceilings, and carvings on buildings and columns. It also included illuminated manuscript art and sculpture. Gothic art grew out of Romanesque art. Gothic artists began to use brighter colors, dimensions and perspective, and moved toward more realism. They also began to use more shadows and light in their art and tried out new subject matters beyond just religion including animals in mythic scenes. Donatello - An Italian sculpture known for his statues of David, Mary Magdalene, and the Madonna. Giotto - Italian artist from the 13th century famous for his frescos in the Scrovegni Chapel in Padua, Italy. Benvenuto di Giuseppe - Also called Cimabue, this Italian artist from Florence was known for his paintings and mosaics. Ambrogio Lorenzetti - An Italian painter of the Gothic movement, he is famous for his frescoes, the Allegory of Good Government and the Allegory of Bad Government. The majority of the literature produced during the Middle Ages was written by religious clerics and monks. Few other people knew how to read and write. Much of what they wrote was hymns, or songs, about God. Some also wrote philosophical documents about religion. One of the most popular books of the Middle Ages was the Golden Legend, by archbishop of Genoa Jacobus de Voragine. It told stories about the lives of the Saints during Medieval times. Some secular, meaning non-religious, books were written as well. Beowulf - Unknown author. This Epic poem was written in England, but tells the story of the hero Beowulf in Scandinavia. The Canterbury Tales - by Geoffrey Chaucer. A series of tales that portray Chaucer's view of English society at the time. Caedmon's Hymn - This hymn, recorded by a monk, is the oldest surviving Old English poem. The Divine Comedy - by Dante Alighieri. Often considered one of the greatest works in world literature, this story describes Dante's view of the afterlife. The Book of Margery Kempe - by Margery Kempe. This book is considered to be the first autobiography written in English. The Ecclesiastical History of the English People - by Venerable Bede. This history of the English church earned Bede the title "Father of English History". The Decameron - by Giovanni Boccaccio. This book has a number of stories and describes life in 14th century Italy. The Travels of Marco Polo - by Marco Polo. This book tells the story of how Marco Polo traveled to the far east and China. Le Morte d'Arthur - by Sir Thomas Malory. 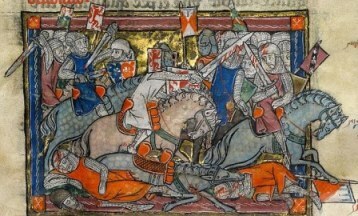 This book tells the story of legendary King Arthur. Piers Plowman - by William Langland. This allegorical poem tells of a man in search of the true Christian life.